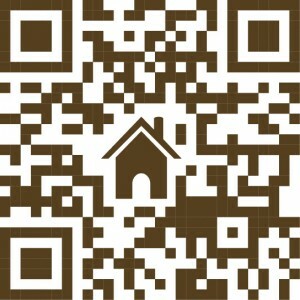 QR codes are part of our real estate marketing programs. When promoting a specific property, we make certain that the QR code points to information about only that property. QR codes allow us to control the narrative about your property’s virtues. We create a more meaningful experience with a web page showing of the property. The QR code allows us to answer questions about the property immediately for the client. This builds interest and confidence in the listed property. Just a bit of background on QR codes, QR or Quick Response codes are two dimensional codes that were originally created by Denso-Way, a Japanese company. Quick Response codes were initially used for tracking parts. Since then QR Codes are used to create a link to an internet web page. People with a mobile device can point their cameras at a QR Code and immediately access additional information via the mobile device or cell phone to the page on our website dedicated to your house listing. QR codes enhance the property real estate marketing plan by giving the mobile consumer immediate information. We can engage the prospect connected by their mobile device through the QR code technology. QR codes have many applications. The most public way includes placing a QR code on any for sale lawn sign. We can put the QR on the sign rider, the small signs under the main sign. Other uses of the QR are printed materials, decals and printed advertising. The only real limits are those of imagination.